Burns Night is almost upon us-the 25th January for those who might be inclined to celebrate the birth of the great Scottish poet. Whisper it in these parts but haggis is not one of my most favourite things. 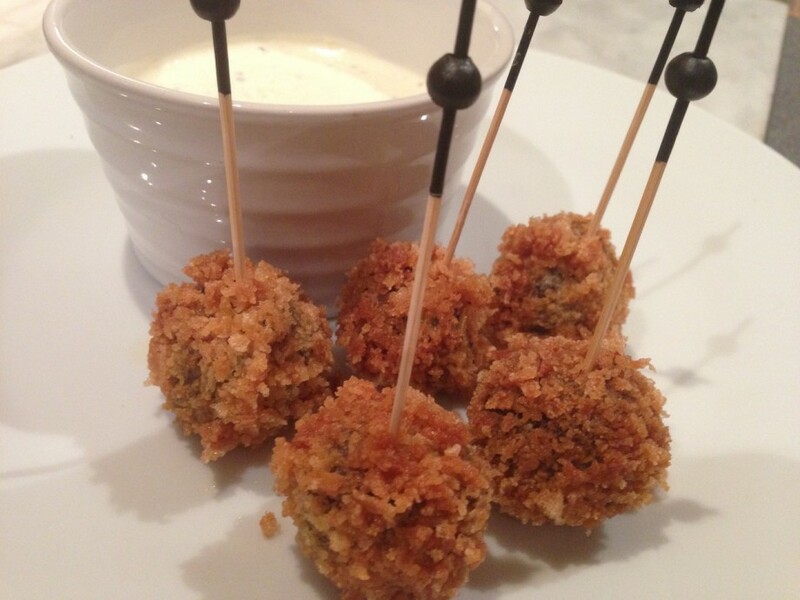 However these crispy little nuggets are how I like to eat the “great chieftan o’ the pudding-race”. I think these work best served as an appetiser but you could make them a wee bit bigger and serve with bashed neeps and tatties as a main meal. Although I’m not sure how one can have a vegetarian haggis Macsweens do a decent version and I think the bonbons would work very well with the veggie mix. In a bowl mix the flour with a little salt and ground black pepper. In another bowl beat the eggs with a pinch of salt. Pour the breadcrumbs into a slightly bigger bowl. 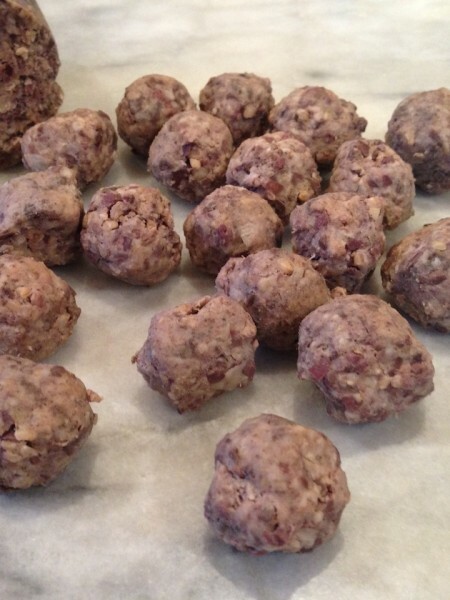 Cut up the haggis and roll into cherry tomato-sized balls. 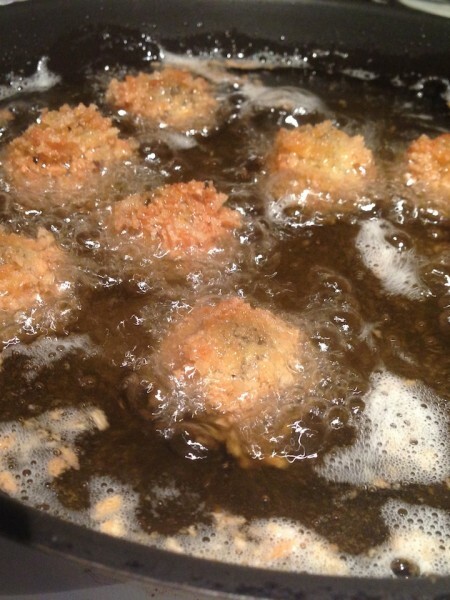 Dip each ball into the flour, then coat with the egg and finally roll in the breadcrumbs. Place on a baking tray and chill for 30 minutes. Heat the oven to 190˚c, fan oven 170˚c, mark 5. Pour the oil into a frying pan and heat to 180˚c. If you haven’t got a thermometer test the temperature by dropping a cube of white bread into the oil. If it browns in about 25 seconds the oil is hot enough. Carefully lower a few bonbons into the oil, about 6 at a time. Fry for 1 minute then turn over and fry for a further 1 minute or until golden brown. Lift out of the pan and drain on a baking tray lined with absorbent kitchen paper. When you have fried all the bonbons place in the oven for 12-15 minutes to heat through thoroughly. For the dip, mix the ingredients together. 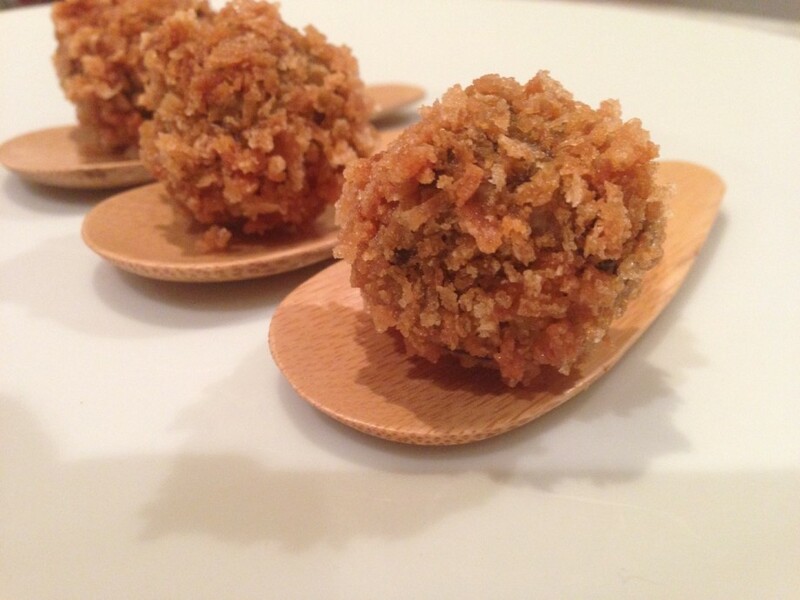 Serve with the haggis bonbons.